Digital Notebook: Can Phoenixville's Success Happen in Pottstown? Can Phoenixville's Success Happen in Pottstown? 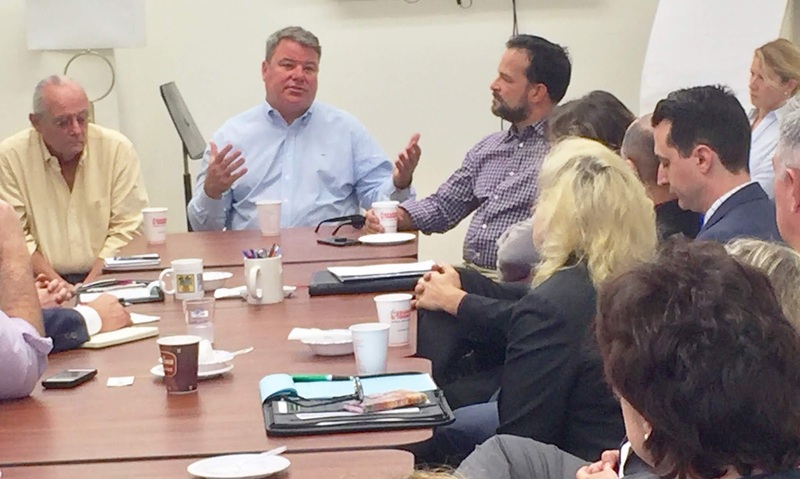 Successful Phoenixville developer Manny Demutis, at the far head of the table, speaks about his experiences there and what lessons could be applied to Pottstown, during a breakfast meeting Wednesday at Hobart's Run offices. Blogger's Note: The following was provided by Hobart's Run. 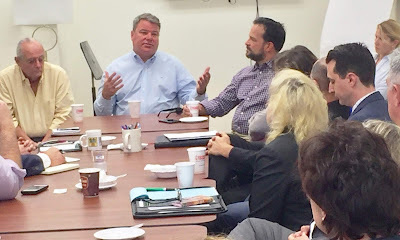 About 25 Pottstown leaders from government, business, and education met over breakfast on Wednesday, to hear insights from Manny DeMutis, president-owner of The DeMutis Group, Phoenixville, a highly successful developer who has helped to lead Phoenixville’s impressive revitalization. 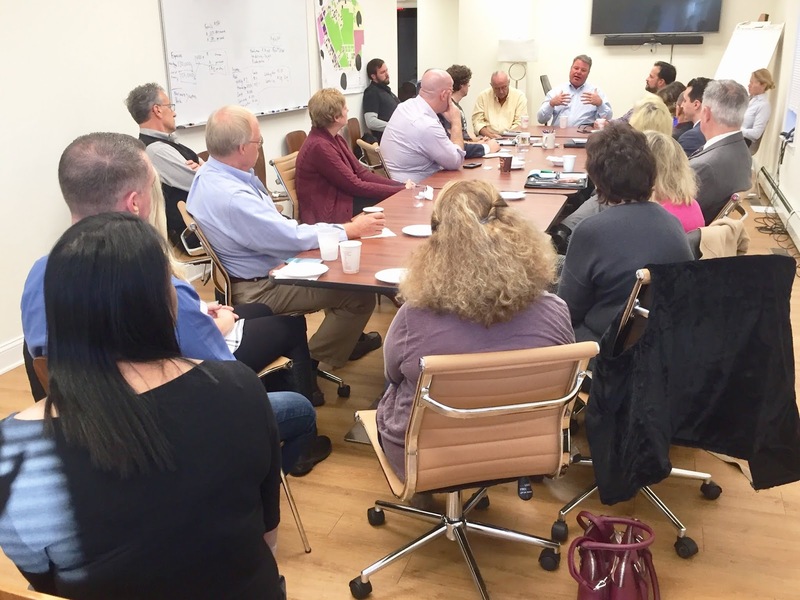 This event, held at the Hobart’s Run office at 701/703 High St. was one of an ongoing series of informal monthly breakfast meetings hosted by Hobart’s Run and The Hill School to spark collaboration and information-sharing in the borough. Joining DeMutis was Barry Cassidy, who served as director of Main Street Development Corporation in Phoenixville from 2003-2010 and a planning and development consultant. DeMutis was introduced by his friend, Charles Gulati, owner of Gatsby’s at The Sunnybrook Ballroom, Pottstown, and owner/president at Stokesay Castle and The Knight’s Pub, Reading. DeMutis says Phoenixville’s renaissance has occurred largely because of the “selfless leadership” of developers and others who have been willing to invest in the once-struggling town and collaborate with one another. He enthusiastically shared a number of key takeaways for the participants at this gathering. 1: While Pottstown folks are quick to compare Pottstown to Phoenixville and point to that community’s impressive reinvention and rebirth, Pottstown has more and even better assets than Phoenixville to work with. “I love Pottstown,” DeMutis said. “You have housing stock to die for. You have a beautiful, wide main street. You have arguably the best prep school in the world, The Hill School, right in your downtown. 2: Pottstown’s development needs to start with revisiting and reprioritizing codes enforcement issues. Much of its focus should be on strictly enforcing health, safety, and “life” related codes, particularly in residential areas near the downtown, as the main streets will then begin to “take care of themselves,” DeMutis believes. The Borough also must be developer-friendly and cut back on nonessential red tape and fees, especially when investors want to restore and utilize buildings that are in great need of care. In addition, the Borough needs to make sure its fee schedule is not higher than it is in neighboring communities, which will make development here far less attractive and competitive. 3. Gaining the commuter train would dramatically increase property values and Pottstown’s tax base, among other benefits. DeMutis has invested heavily in planning for a pilot project that, if successful, will use some of Norfolk Southern’s freight rail tracks to link Phoenixville to the Norristown/Manayunk line. “But if someone says ‘you can’t do it,’ they’re probably not right,” he declares. He emphasizes that when there is a passenger rail system within a three-mile radius of a house, the average affected homeowner sees an average increase in value of $31,000. The train would bring “instant equity,” DeMutis says. 4. Pottstown needs to aggressively promote its Local Economic Revitalization Tax Assistance (LERTA) program to developers — as well as the value of our architecturally beautiful housing stock and downtown commercial buildings. LERTA is a state law that allows local tax incentives for business property improvements. Pottstown’s LERTA provides tax relief to approved properties over seven years. In the first year, after improving a property, the owner receives a 100 percent exemption on the taxable value of the improvements; by the seventh year, the reduction is 10 percent, and after that the LERTA relief ends. 5. Don’t be afraid of rental properties, as that’s the trend in housing, DeMutis says. However, developers should focus on getting rentals up to market value. Redeveloped Phoenixville apartment and other rental property rates have increased – and, in fact, many of these spaces have been converted back to single family homes. concerns get in the way, DeMutis asserts. Phoenixville now offers at least 13 summer festivals, “synergistic, common experiences” that bring people to the downtown and create excitement in and about the community, he says. His pie in the sky comments are mostly only dreams. Train service would be great but has been discussed for decades so realistically that is not happening soon. Our tax money has paid for the same assessments of Pottstown's potential and they never amount to anything. Phoenixville is much more appealing than Pottstown for 2 reasons. No horrible 422 traffic east bound at rush hour and closer to Philly. In these 2 issues Pottstown cannot compare. Pottstown leadership has been a failure and doesn't improve because voters and council refuse to make changes. I could go on and on. This guy has good intentions but he obviously doesn't have decades of experience with disappointment in Pottstown. Wait until next recession and we will see all these High Street businesses once again go out of business. I headed a NYC Local Development Corp., many of the recommendations make sense. What is needed is "buy-in" by the local government, business and civic leaders. Pottstown can rise again, it has to WANT to do it. Or you could do what demutis did and start big fires for insurance money. Or burn down the section 8 housing that is getting built so when phase 2 of phoenix village gets built, it wont hurt prices. Also having JD councilman in your pocket helps. Maybe start by burning down America's Best Value Drug Den and Crack Whore Inn. That place isn't any worse than the crap hole Manny's dad ran AKA: The Wall Block Hotel. I am sure Evan will agree that these conversations of the revitalization of Pottstown happened 5, 10 and 15 years ago. Nothing happened then so why should we believe it will happen now? How do you hold a meeting about the future of Pottstown without a single person of color in the room? Seems to me that this meeting pretty much IS the problem, not the cure. This is a great point, Anonymous. Maybe it’s you decades of disappointment with Pottstown that keep you from having vision. Anything can be done if you develop a plan and resources. You’re right Phoenixville doesn’t have 422 traffic, they have local traffic to gat to 422. And it is only 10 min closer without traffic... as far as train service, things take time. It’s a benefit that it has been discussed for years now. They know what doesn’t work so they can determine what will. It the kind of negativity that you posted here that keeps Pottstown stuck. No solutions just complaints about how bad it is and it won’t work. If train service were the ticket to redevelopment and increases in property value, Norristown would be a Paradise. And of course, you hear no mention of low income residents and how any large scale redevelopment will affect them. Vision and realistic expectations are two different things. Is it possible Pottstown recovers and turns into a Conshohoken or Phoenixville like town? Maybe. In the near term? Highly unlikely. I laugh when members of Hobart Run and outside speakers try to assess Pottstown. The reason why is because unless these members work for the Borough or have an inside source to the top leadership they only have 1/2 the story. This means they really don't know what the issues are behind the scenes and don't even know where to start to research these issues. You doubt this statement? Without doing research answer the following questions. The heads of each department. How long they have been employed. What are their strengths and weaknesses. What are the pending issues facing the Borough in 2019 that have not made the headlines. What are the issues before council at the next meeting. That's right. You don't know the answers but you think you know the town. If you open a business in Pottstown that is NOT retail you have a chance of being successful. If you open a business that is retail, especially on High St, your chances of success are slim. Success is defined as making a significant profit over the long run not just keeping the lights on. Next time you meet a Pottstown business owner ask them this question. If you know what you know now would you ever have invested in Pottstown? If you could get the money and time back that you put into Pottstown would you take it back and go in a different direction? You only need to live in pottstown is if you want to send your kids to pottstown schools. Once pottstown has first class schools, people will move here, and property values will rise.